In 2001 Cadw funded the Trust to carry out a watching brief at Croesgoch, Pembrokeshire following the discovery of two cist burials during a small housing development. One of the slab-built cist graves was revealed within the area being stripped for an access road to two new houses. The upper part of the skeletal remains were lifted by the contractors and taken by Pembrokeshire Museum Service. 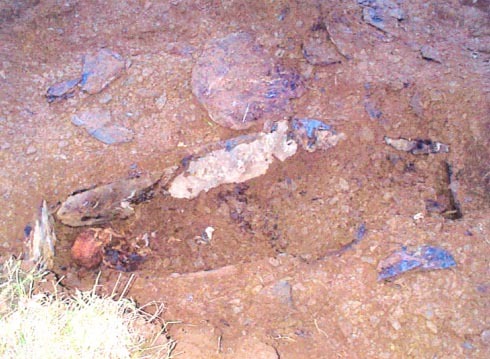 During 2002/2003, Cadw agreed to support the production of two radiocarbon dates from the skeletal material and the preparation of a short report on the discovery for publication. At two sigma calibration the dates were Cal AD 410-600 (Beta 177038) and Cal AD 370-540 (Beta 177039). These are the earliest dates yet obtained from a west Wales long-cist burial. They lie within the late Roman and early post-Roman period of Irish settlement that, in west Wales, is associated with the erection of Group I Early Christian Monuments. The report has now been submitted for publication to Archaeology in Wales.